Southern California’s Thomas fire is now officially the largest in modern state history, Cal Fire announced late Friday night, after surpassing the 273,000-plus acre Cedar fire from 2003. Per CNN, Cal Fire says the blaze has now burned through some 1,063 buildings and is just 65 percent contained weeks after starting on December 4th. It also said it expects fire crews to be working on the blaze 24/7 until at least January 7th. The fire began in Ventura County and spread to neighboring Santa Barbara County, fueled by flame-optimal winds and plenty of dry brush to burn. As the L.A. Times reported, the official list of wildfires only dates back to 1932 because prior records are less reliable. One contender for the all-time spot remains the 1889 Santiago Canyon fire, which reputedly scorched some 300,000 acres (and some research supports those accounts). Large stretches of southern California now lie in ruins. In some cases, the fire spread so fast that terrified residents were forced to evacuate without their possessions in the dead of night as smoke surrounded their homes. According to officials, this is the worst season for wildfires in memory. Wildfires have ravaged vast parts of the state this year, with blazes burning from southern California all the way up to wine-growing regions hundreds of miles to the north. 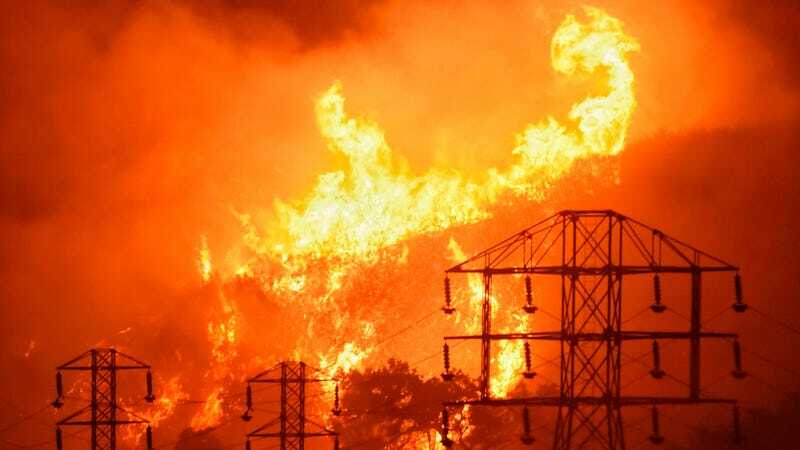 The frequency of massive fires in the state has dramatically increased in the last few decades, due to both accidental blazes started by humans and trends linked to climate change like extreme droughts. “We think that this fire, the Thomas fire, is likely very large in part not just because the Santa Ana wind event is long, but there was this very extreme drought between 2012 and 2014,” UCLA and U.S. Geological Survey research ecologist Jon Keeley told the Times. Fire officials said that the blaze is contained enough that any further spread will be the result of deliberate actions by firefighters, not uncontrolled expansion.